The Holiday Inn Express Hotel & Suites Charlotte Concord Area is the closest hotel to the Charlotte Motor Speedway/Concord Mills Mall. We are conveniently located at exit 49 off I-85 and offer free internet throughout the property. Additional amenities include complimentary hot buffet breakfast, parking and local phone calls. We have a variety of rooms and suites which all come equipped with a microwave, refrigerator and Keruig coffeemaker. 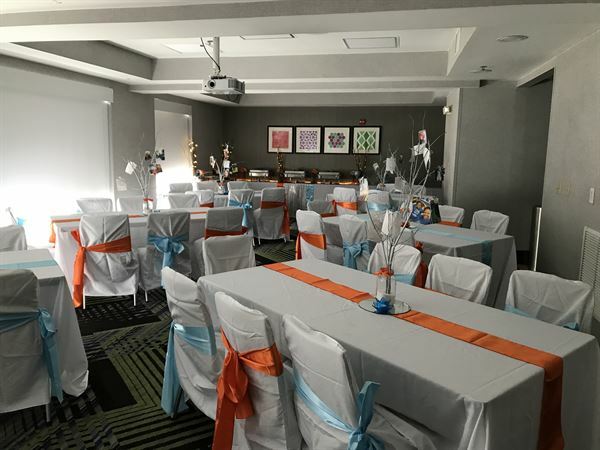 Our recently renovated meeting room can hold up to 50 people for social and corporate events. Our beautiful new Meeting Room is 950 sqft, and can seat up to 50 people, depending on setup style. Our most common setups include classroom, theater, u-shaped and reception styles. Usage of our projector screen and projector are included as well.